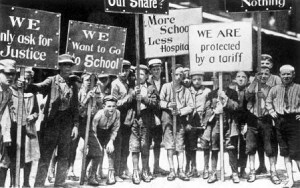 July 29, 2015 - Segment 1 - On this day in history, radical union leader Mother Jones led a march of mill children to the doorstep of President Theodore Roosevelt to expose conditions that children as young as 4 or 5 experienced working in sweatshops. On this day in history, radical union leader Mother Jones led a march of mill children to the doorstep of President Theodore Roosevelt’s summer home in Oyster Bay, New York to expose conditions that children as young as 4 or 5 experienced working in sweatshops. That’s the sound of the choir in the oldest Black church continually owned in America .. the mother church .. The Mother Bethel African Methodist Episcopal Church in Philadelphia. It was founded in 1794 when the then-Methodist minister Richard Allen walked out of their segregated church to found his own church dedicated to Black people and to freedom. In 1816, Bishop Allen, along with others, founded the the African Methodist Episcopal Church, the AME. He, his wife Sarah and Bishop Morris Brown are entombed in that church, still open, still believing, still a home welcoming everyone. The Irish had been suffering from the potato famine for four years with thousands dying and many fleeing to the United States. But on this day in 1848 as revolutions were sweeping through Europe, the Irish Revolution erupted, demanding independence from Britain. A man named William Smith O’Brien, who was a leader in the rebellion, ended up being arrested and sent to prison even though he tried to negotiate with the English. Ireland would not gain independence until 1927, still under the Crown, and its republic would not appear until 1949. It was 1903 and the radical union leader Mother Jones led a march of the mill children to the doorstep of President Theodore Roosevelt’s summer home in Oyster Bay, New York to bring his attention the enslaved-like conditions that young people as young as 4 or 5 were held in to work in the sweatshops. They worked 70-80 hours a week making textiles, clothing and more. They could not get through the gate, but the President got the message. Fearing revolution at his doorstep, he began to fight with Congress to pass legislation that led to the child labor laws in this country. Hundreds of African American men in rural Alabama who were told they were receiving free health care from the U.S. government were actually being infected with syphilis by the U.S. Public Health Service in the infamous Tuskegee experiment. Forty years after the Tuskegee experiment began in 1932, it was exposed today in 1972 by a social worker named Peter Buxton, whose Jewish father and Catholic mother fled from the Nazi takeover of Czechoslovakia when he was just an infant. By the time he uncovered this racist outrage, 28 of the original 399 men that were infected in the study had died of the disease. One-hundred other men were dead of related health conditions. Forty of their wives had been infected and 19 of their children were born infected. Funded to eliminate syphilis, the Tuskegee Experiment deliberately infected men with syphilis and refused to treat them so they could be studied, unbeknownst to those men and their families. This was all just 43 years ago. Sir Robert Baden Powell founded the Brownsea Island Scout Camp today, setting off with his nephew and a few of his friends to a nearby island to set up camp. It is considered the founding of the Boy Scouts. What we do not give credit to is that his ideas for scouting came in large part from his knowledge of Native Americans and from his living with the Zulu nation when he was a British Army officer. We do not often acknowledge the African and Native roots of scouting. What is it about the world that we are so enamored with royalty? Today in 1981, 700 million people across the globe were glued to their TV sets to watch Prince Charles and Lady Diana Spencer marry at St. Paul’s Cathedral in London. And it’s the birthday of George Little Chocolate Dixon, the first Black man and first Canadian-born fighter to become a world champion. He was born today in 1870 in Halifax, Nova Scotia, descended from those who fought with the British in the American Revolution and from those fleeing slavery in America. In 1890, he won the World Bantamweight Championship and then the next year the Featherweight Championship. Dixon is credited with creating the boxing training art of shadow boxing. Grant Reynolds was born today in 1908 in Key West, Florida. He was a minister and the first Presidents of the Cleveland Chapter of the NAACP. He joined the army in 1941 as a minister, but resigned in protest of the racism, segregation and unequal treatment he experienced and witnessed. He then founded with A. Philip Randolph the Committee Against Jim Crow in the Military Service and Training that directly led — after a long battle — to the end of segregation in the armed forces.